Harrogate RUFC have pulled off a “massive coup” in landing the services of former Exeter Chiefs fly-half Sam Fox. That is the view of the club’s director of rugby Dave Doherty, who beat off the competition to sign the highly-rated 19-year-old following his return from a spell playing in New Zealand. ”Sam is a player with fantastic potential who will prove a great addition to the side,” Doherty said. “His skill-set in the number 10 position is impressive, and despite his relatively young age he’s got some good experience of playing at a high standard. With the Cockerels battling to avoid relegation from National Two North, re-inforcements to their back division were a must for Doherty. “We needed to strengthen in the backs,” he added. “We’ve got a lot of very talented but very inexperienced lads, and they are still learning the game. “Charlie Morgan has done well at fly-half so far this season, but it’s a lot of pressure on young shoulders, and I don’t want to ask too much of him. Fox, who lives in Bude in Cornwall, was a member of Aviva Premiership outfit Exeter’s academy side before heading over to New Zealand in May 2015. 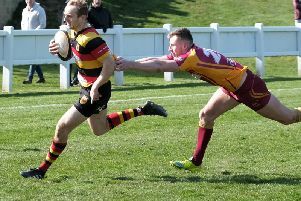 He turned out for Scots College in Wellington, club side Poneke Premiers and also for Wellington under-19s during his spell abroad, but says he cannot wait to get started at Rudding Park. “I’m really looking forward to it,” added Fox, who is due to arrive in Harrogate in early January. “This is a fantastic opportunity for me to improve my game, while working under the guidance of Dave Doherty. “Obviously the main aim is to try and move up the league and avoid relegation, and I’m hopeful that I can help the club do this.